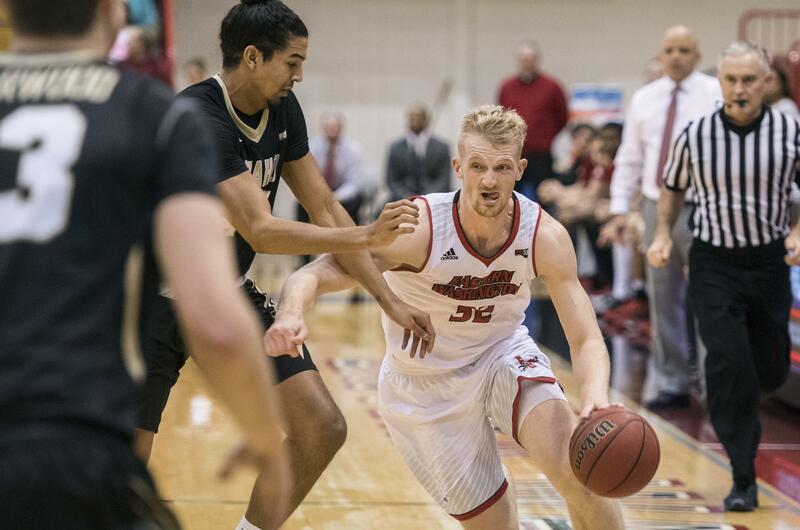 UPDATED: Mon., March 5, 2018, 6:50 p.m.
RENO, Nevada – Eastern Washington coach Shantay Legans said it after every game, every practice, all season long: Bogdan Bliznyuk is the best player in the Big Sky Conference. Someone listened, because the Eagles senior forward earned the honor Monday morning in a vote of league coaches. Bliznyuk’s stats did most of the talking. In conference games only, Bliznyuk finished third in minutes played (36.4), third in scoring (22.2), fifth in rebounding (7.6), second in assists (5.6) and first in free-throw percentage (98.7). For the season, his 20.6 scoring average almost matches the combined total of the next three Eagles (21.1 by Cody Benzel, Sir Washington and Mason Peatling). Beyond the numbers, Bliznyuk meant more to his team than anyone else in the Big Sky. Most important, Bliznyuk led a team picked to finish seventh to a surprising third-place finish. The Eagles are 13-5 going into this week’s Big Sky tournament. “He’s the heart and soul of our offense, every single game,” Legans said. Bliznyuk is Eastern’s second straight MVP but only the fourth overall in its 31 years as a Big Sky school. Last year, Jake Wiley took the honor. Before that, it was Rodney Stuckey in 2006 and Alvin Snow in 2004. When Eastern last went to the NCAA Tournament, the Eagles had national scoring leader Tyler Harvey. However, the Big Sky MVP award went to Mikh McKinney of Sacramento State. EWU sophomore forward Mason Peatling was an honorable mention selection after averaging 7.6 points and 5.7 rebounds. Conference regular-season runner-up Idaho placed seniors Brayon Blake and Victor Sanders on the first and second teams, respectively. Blake was outstanding for the Vandals this season, averaging 16.6 points and a league-best 9.5 rebounds for the season. He stepped his game up in conference play, averaging 18.3 points and 9.6 boards per contest as the Vandals (14-4 in the Big Sky) beat league champ Montana and swept Eastern. Blake recorded 11 double-doubles on the season, including seven in Big Sky play. Sanders earns his third consecutive All-Big Sky recognition, after earning second-team honors in 2015-16 and first-team honors in 2016-17. Sanders led the Vandals with 19.0 points per game, the fourth best average in the conference. A total of five schools were represented on the first team, with Bliznyuk being joined by Northern Colorado’s Andre Spight, Weber State’s Jerrick Harding, Montana’s Ahmaad Rorie and Idaho’s Blake. Spight was tabbed the newcomer of the year and Portland State’s Holland Woods collected freshman of the year honors. Montana’s Michael Oguine was named defensive player of the year and Idaho State’s Brandon Boyd was named top reserve. Coach of the Year will be announced on Wednesday. Published: March 5, 2018, 10:25 a.m. Updated: March 5, 2018, 6:50 p.m.